VW will be dedicating more than two-thirds of its $82.5 billion investment budget to creating more fuel efficient vehicles and factories from now until 2016. Volkwagen AG has announced that it will spend more than $55 billion over the next four years, in an attempt to reduce carbon emissions from both its factories and vehicles. The pledge coincides with Volkswagen’s overall goal of increasing its credibility as an environmentally friendly automaker. VW revealed the news in a press release on Monday and will continue detailing the plan at this week’s Geneva Motor Show. "Geneva 2012 marks the start of a fundamental ecological restructuring of the Volkswagen Group", Prof. Dr. Martin Winterkorn, Chairman of the Volkswagen Group Board of Management, on Monday. "Our declared goal is to make Volkswagen the leading automaker in ecological terms, too." The German company stated that its 2015 model-year vehicles would have approximately 30 percent fewer admissions compared to 2006 model-year vehicles. VW also said that each new model generation after 2015 would improve efficiency by a minimum of 10 percent. According to Winterkorn, VW is presently increasing vehicle efficiency with the help of the Modular Traverse Toolkit, a series of efficiency technologies available on all new models. "Based on the MQB, the Volkswagen Group's efficiency technologies will be available as standard in all new models over the coming years. The next big milestones this year are the Audi A3 and our best-selling model, the Golf,” said Winterkorn. Aside from improved vehicle efficiency, VW plans on cutting factory-generated greenhouse-gas emissions by 40 percent over the next eight years. Additionally, it will invest roughly $800 million on renewable energies like wind, solar and hydroelectric. "Volkswagen is not only working on developing the most environmentally-friendly vehicles, but also on building them with the greatest possible sustainability. That is why we have set ourselves the target of making production in the Volkswagen Group 25 percent more environmentally compatible by 2018," Winterkorn said. VW’s new fuel efficiency announcement comes just weeks before the VW Up! is set to hit Europe. Part of the Volkswagen Group New Small Family (NSF), the VW Up! is a supermini city car available in both 3-door and 5-door hatchbacks. The vehicle’s four variations are on display this week at the Geneva Motor Show. VW has not announced whether Up! will be available in the U.S. Apart from Up!, VW also just debuted the new Cross Coupe TDI plug-in SUV in Geneva as well. 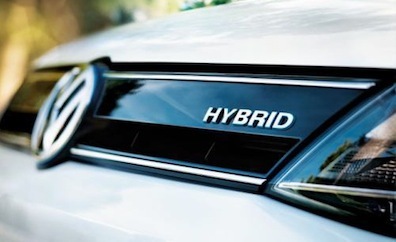 Lastly, VW will be premiering its new plug-in hybrid, the Golf PHEV, at the Paris Motor Show this September. The Golf PHEV will be made available to the public in 2015. Based on 2010 vehicles, the most recent year that the Environmental Protection Agency (EPA) has released, VW’s U.S. vehicle lineup averaged 24.6 mpg, ranking it third amongst the 14 biggest vehicle makers in the American market.